Could this be the afterlife? I’m walking through a valley green the color of moss, the smell of sulfur and freshly damp soil pungent in the air. Bubbling hot geysers spring forth from milky turquoise pools along my path. Steam rises up in soft plumes, hot breath meeting the cool air, as it escapes from tuffets sprinkled about the earth. Waterfalls trickle and follow the gentle curves of the rolling hills surrounding me. Overhead, the sky is a brilliant, crystalline shade of blue, bright white clouds drifting lazily along its canvas. Perhaps I needed to check my pulse. This looks like paradise. This feels like paradise. Yep, this is definitely paradise. Thankfully, a quick check of the pulse revealed I was indeed alive and well. I was simply taking in the most majestic scenery I had come across yet in my Iceland travels. You see, I was hiking the Reykjadalur Valley. I was hiking Heaven on Earth. WHAT IS THE STEAM VALLEY? 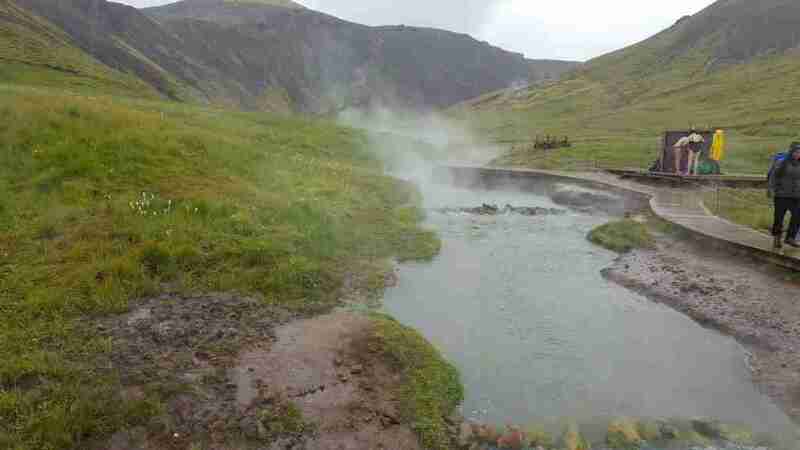 Reykjadalur Hot Spring is a beautiful hiking area situated in the rolling hills of the Ölfus region in Southwest Iceland. Reykjadalur, which directly translates to “steam valley”, is just that: a valley ripe with geothermal activity and steam rising from its hills. Hikers can enjoy the gorgeous scenery the trails provide and be encouraged during its more challenging uphill climbs that a fantastic reward awaits around the bend: a soak in a hot river warmed by the surrounding geothermal energy. Nature hot tubbin’ for the win! The beaming, squinty faces of two hikers who made it to the pot of gold at the end of the rainbow! 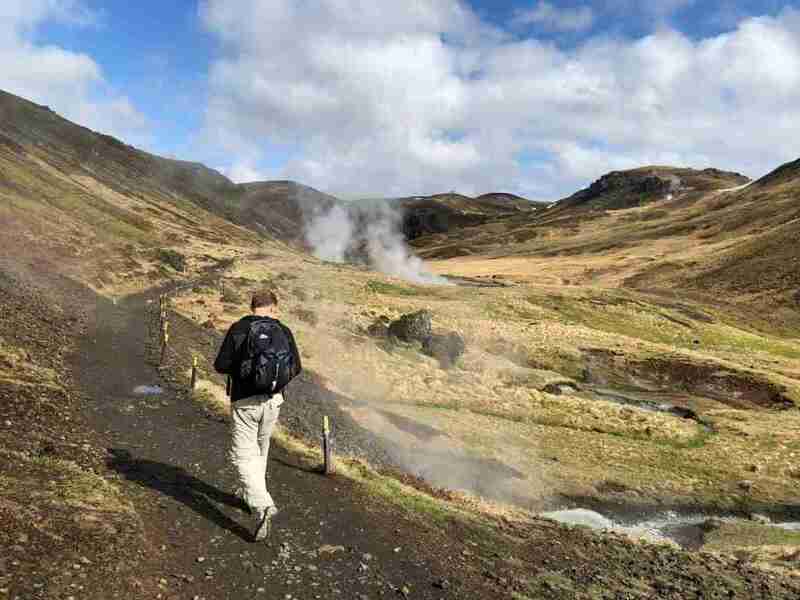 The steam valley is a short 50-minute drive from Reykjavik, making this a perfect half-day excursion if you’re staying in the city or flying in/out of Keflavik airport. It’s free! With all the talk of how expensive Iceland can be (and it can be) this is a not-to-be-missed-gem that fits into any travel budget! Hiking the steam valley is like hiking inside the glossy pages of a National Geographic magazine. You won’t believe your eyes or your luck that this is your current reality. It is truly that sublime. We observed everyone hiking to the hot river, and I mean everyone, from families with small babies in arms to elderly couples walking hand in hand. We even saw a group of local runners sprinting the impressive uphill climb. 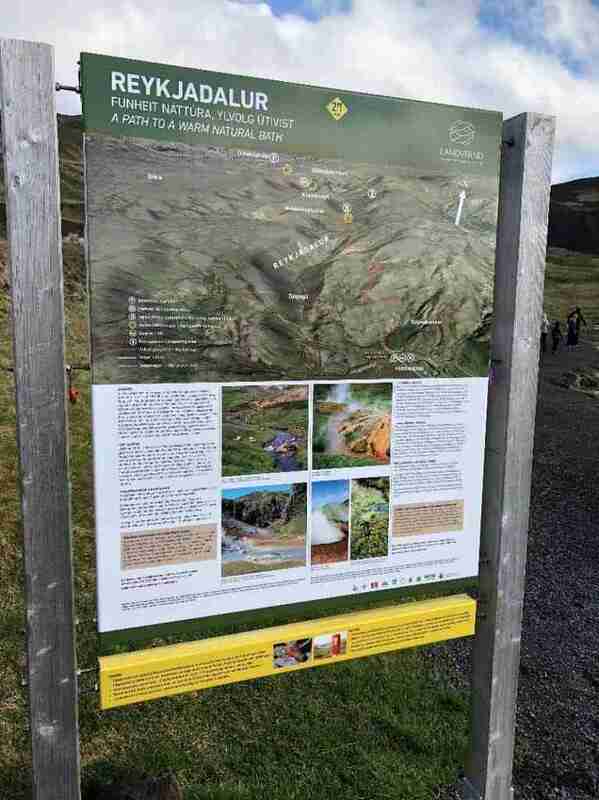 It appears that in Iceland, there is no excuse: you get outdoors and you hike all the hikes. Rain or shine, young or old. Can I just say I adore the tenacious spirit of Icelanders? That said, this is a hike of moderate difficulty. You will spend an hour, give or take, climbing a near-constant incline. The end result (reaching the hot river) is amazing and the hike itself a beautiful journey, but you will feel this in your lungs and quads! Prepare to do a little work and the reward will be well worth it! Check ahead that the trail is open for hiking. Safe Travel is a terrific resource. The trail had just opened up the very day we planned to hike it after having been closed for many weeks (eureka! ), so things can turn on a dime one way or another. Keep informed. If the trails are open, you are in for a treat, but please: stay on the paths and follow all signage. Doing so helps keep the trails healthy and passable so that they can remain open and available to all! Bring (and wear) the appropriate gear in a small backpack, keeping in mind that the weather in Iceland changes frequently and without warning. Wear sturdy, waterproof hiking boots. Now’s not the time to slip on your treadless lawn-mowin’ sneakers or killer wedge sandals and hope for the best. Have your swimwear on underneath your clothes. Makes for the quickest transition from fatigued hiker to blissed-out bather! 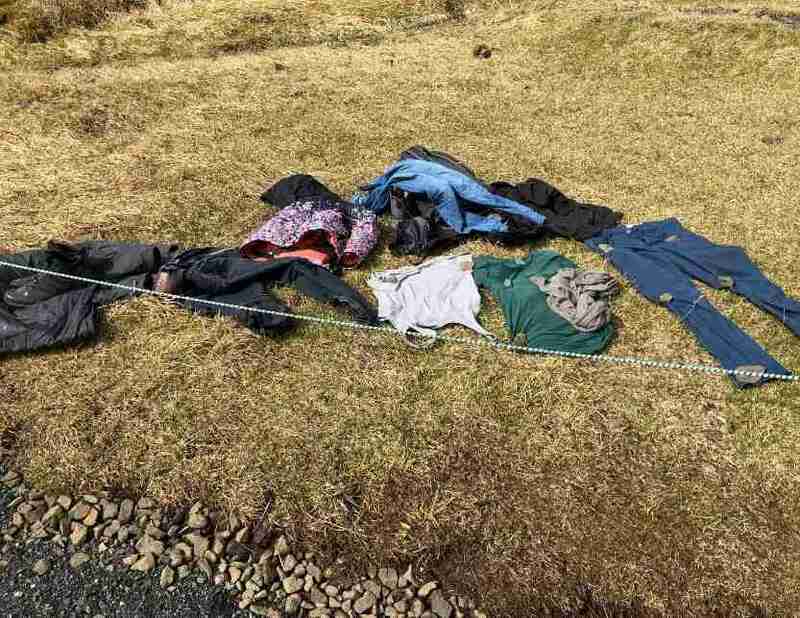 Evidence of The Rapture? Nope! Just eager bathers hittin’ the river! Skip the jeans. If they get wet you’ll be primed for chafing and the worst kind of misery! Quick-drying hiking pants or shorts work best. Bring outerwear. A light rainjacket or packable down is smart even if its sunny and beautiful at the start of your hike. In Iceland, you just never know. Sun protection. Think a brimmed hat and/or sunscreen! Bug spray. Gnats were out in full force the day we went and it was impossible not to keep a few of those buggers from going down the ol’ hatch. Yum? Water in a reusable bottle and light snacks if gnat fuel isn’t exactly your thing. A packable towel. 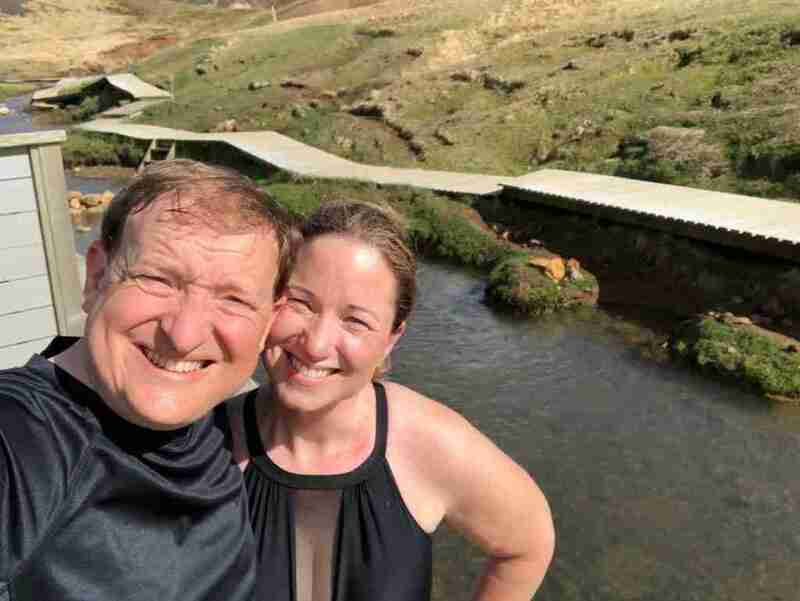 The only regrettable part of the hot river experience is leaving its soothing waters only to have your wet (and now cold) skin meet the harsh Icelandic wind. You’ll be glad you brought this! Make the nearby charming town of Hveragerði a stop after your hike. You’ll find great options for lunch or dinner after you’ve accomplished your uphill climb and enjoyed your subsequent soak. 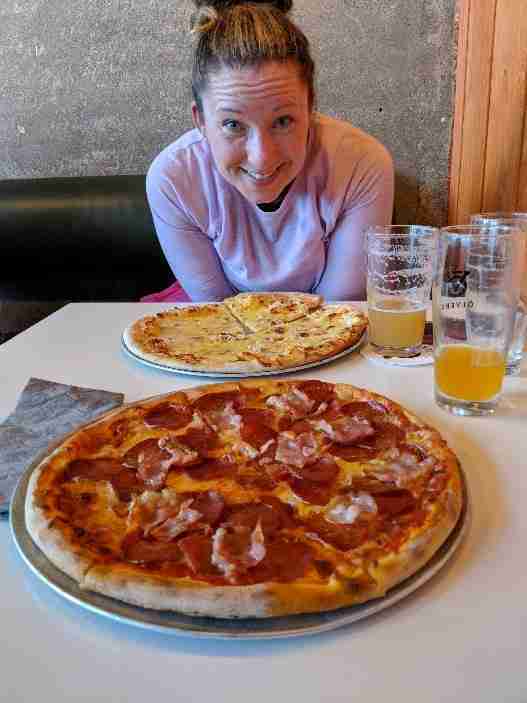 We went to Ölverk Pizza & Brewery and promptly ate our faces off. Pizza and beer never tasted so good! A perfect end to the most perfect day in paradise! The Reykjadular Hot Springs Hike was a highlight during my travels in Iceland and it can be one of yours too! Ask Nordic Green Travel to include it in your tour or itinerary for an unforgettable experience! Click here to choose your self drive adventure.